Chaim Perlman, suspected of killing 2 Arabs following 1998 terrorism, has tapes showing that agents incited him to murder. INN has the transcripts. 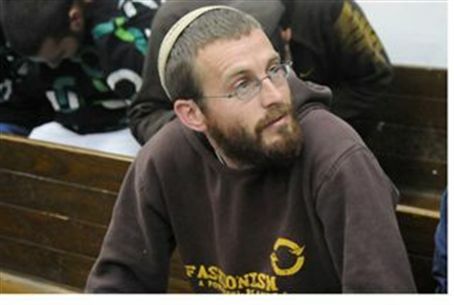 The much-publicized arrest on Wednesday of Chaim Perlman, 30, has set off a chain of events that has left the Shabak (Internal Security Agency, or ISA) very much on the defensive. Perlman is a member of the religious-Zionist Givat Washington community near the coastal city of Ashdod. Following the arrest, it was said in the name of "sources close to Perlman" that he has evidence proving that the ISA tried to goad him into carrying out illegal acts. Soon afterwards, the ISA came out with a response. "Perlman was arrested on charges of having perpetrated serious crimes," the ISA stated, "including two murders and additional attacks against Arabs." Specifically, Perlman is suspected of having stabbed eight Arabs in the Meah She'arim section of Jerusalem over the course of a year in 1998 and 1999. It is suspected that the attacks were motivated by the terrorist murders of two religious men, David Katorza in Ramat Shlomo and Chaim Kramer in the Old City. The ISA further says that Perlman was found after months of intelligence efforts, which included "a number of meetings held by ISA agents with him a number of months ago, and other intelligence-gathering activities – all with the purpose of gathering more information about him. During these meetings, the suspicions against him received corroboration." "Any claim attributing to the ISA an attempt to entrap him is totally groundless," the ISA statement. Tapes recorded by Perlman himself during the meetings, however, appear to paint a different picture. Arutz-7's Uzi Baruch read the transcripts, and noted that in one of the conversations, the ISA agent attempted to convince Perlman to perpetrate a "small fireworks display in an Arab village." Perlman is heard rejecting the idea: "Go with the right people, and it will work," he says. In another conversation, the agent tried to persuade Perlman to attack Raed Salah, head of the Islamic Movement. "We'll go to one of the villages in the north," the agent said. "Someone like Raed Salah – we'll give him a fireburst and the chances are that he will be killed… It is most likely that the driver will be killed. You have to empty out a magazine or place a bomb in the car." Another agent told Perlman at different times, "I would have killed all those on the [Turkish flotilla ship] Marmari… I would be willing to sit in jail for getting [Arab MK] Taleb A-Sana." Sources close to Perlman said the ISA took advantage of his financial straits and paid him 1,500 shekels per meeting. "The ISA has crossed all red lines," the source said. "There's a difference between sending someone to get a suspect to talk, and sending someone to try to get him to commit murder… The ISA is under pressure now because the tapes with the conversations have been disseminated, and it has no way of getting them back."